One can never have too many clam recipes, can they? 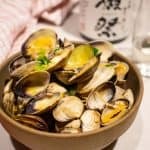 Similar to this miso quickie clams recipes, clams are so easy to prepare as an appetizer, party food, or even main course. It also seems that Iron Chef Morimoto ate them often. 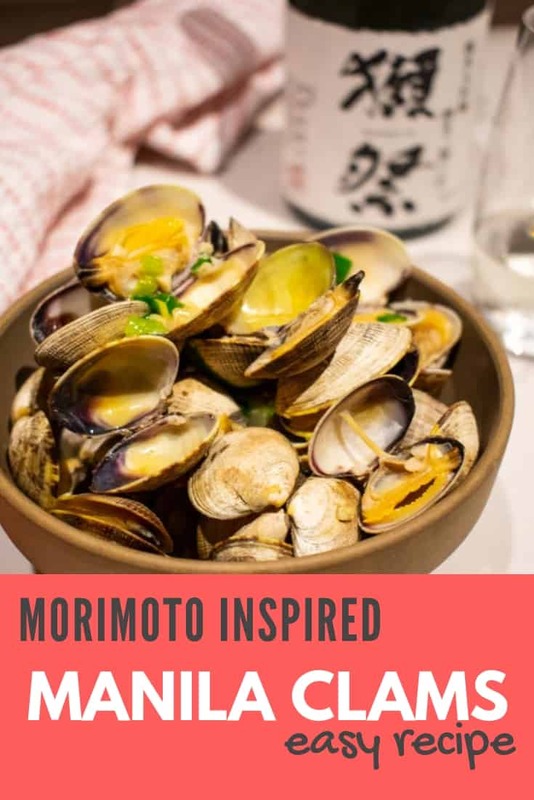 According to this article, Chef Morimoto has fond memories of his mother’s sake steamed clams, harvested from the Seto Inland Sea in Japan where he grew up. It seems, however, his mother was not the best cook. Kind of odd the article would mention that, but they did. 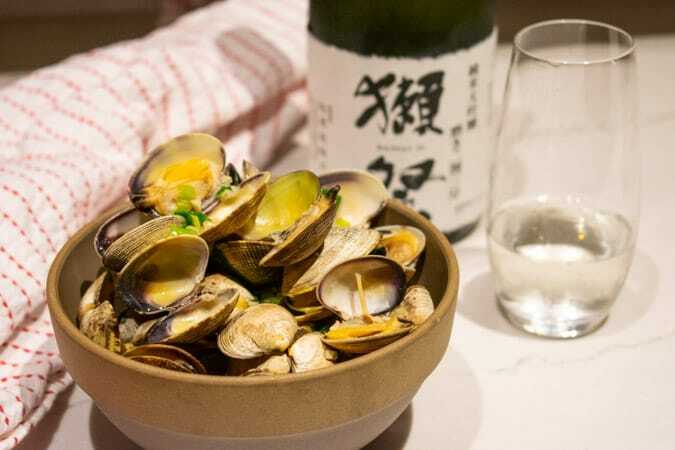 In an effort to improve his mom’s recipe, now Morimoto adds soy sauce, garlic, and butter to his sake clams. 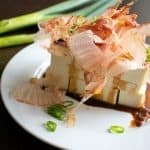 Here is a recipe that recreates what Morimoto might eat in his own home. Clams often contain little particles of grit and sand. Soak in salted, cold water to purge as much of it as you can. 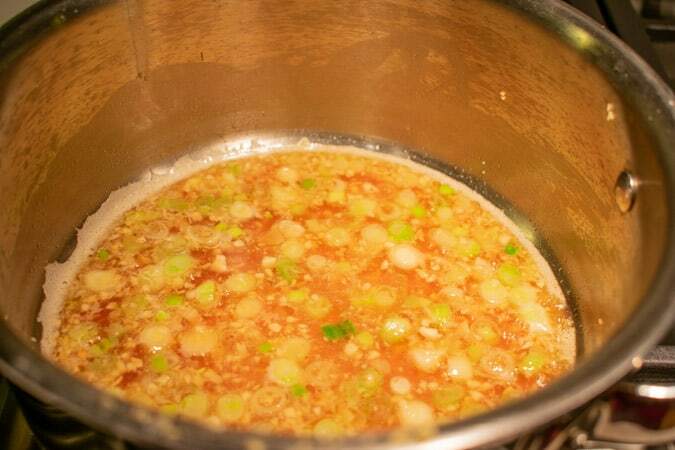 The grit will also come out in the cooking liquid leftover in the cooked pan, so take care not to pour that into the serving bowls. 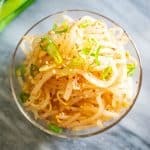 This recipe also requires chopped garlic and green onion. Keep the green and white parts of the green onion separated. 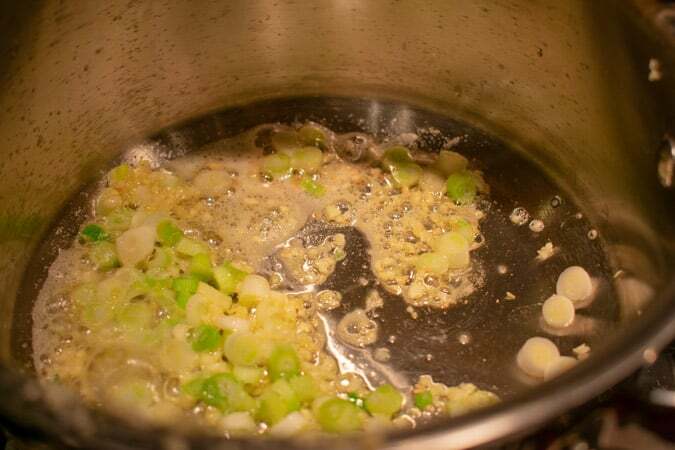 Over medium heat, saute the garlic and white part of the green onion in some oil. Add the sake and soy sauce. Bring to a simmer and let the sake burn off some of the alcohol for about 30 seconds. 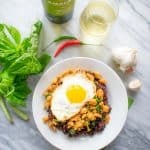 The sake you use would ideally be better than a cooking sake that you might even drink if you had to. 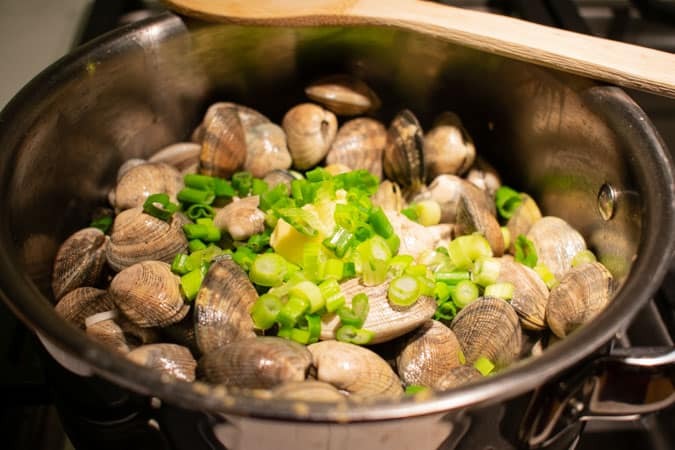 Turn the pan to medium high heat and add the drained clams, butter, and green onion. Clams have a natural timer and will open once cooked. Keep stirring the pot to ensure clams at the top and bottom have continuous access to the heat on the bottom of the pot. Discard any clams that have not opened, since they are dead. Clams should be cooked within 1-2 days of purchasing. 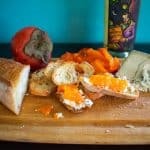 The can be stored in the refrigerator with wet paper towels on top to keep them moist. 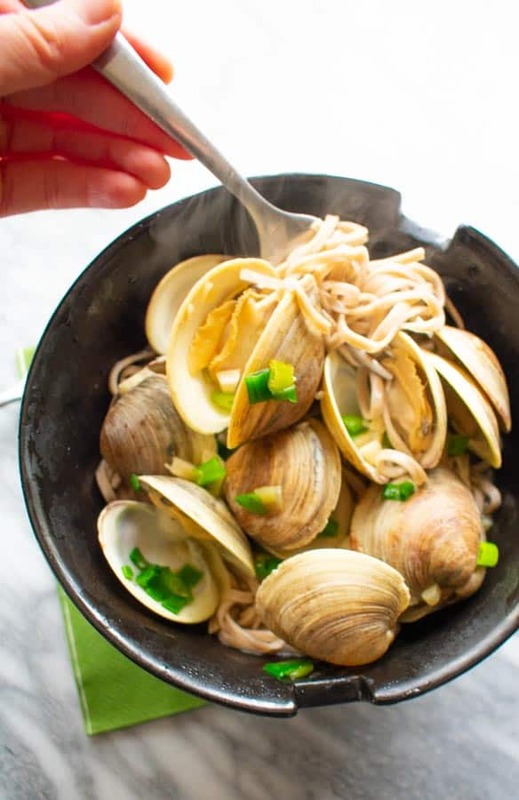 This recipe for manila clams could be served on its own or served over some hot buckwheat soba noodles, for a whole grain version of the Italian classic spaghetti with clams. At this price point, this sake should be for drinking only and not cooking. Is it worth the price of $79? It is a full, rich flavored sake with plenty of soy sauce and umami notes but still has a very clean flavor with some plum and dark brown sugar. Apparently, it was good enough for President Obama, since this is what Prime Minister Abe gave him when he visited Japan. This is a Junmai sake, which means it is only made with rice, water, yeast, and koji – a mold used for fermentation. Most junmais are milled to at least 70% resulting in a finer, cleaner flavor from the heart of the rice kernel. The 23 in the name signifies that the rice kernel is milled to just 23%. The other 77% of the rice grain is polished off resulting in an extra special, finely milled Junmai sake. 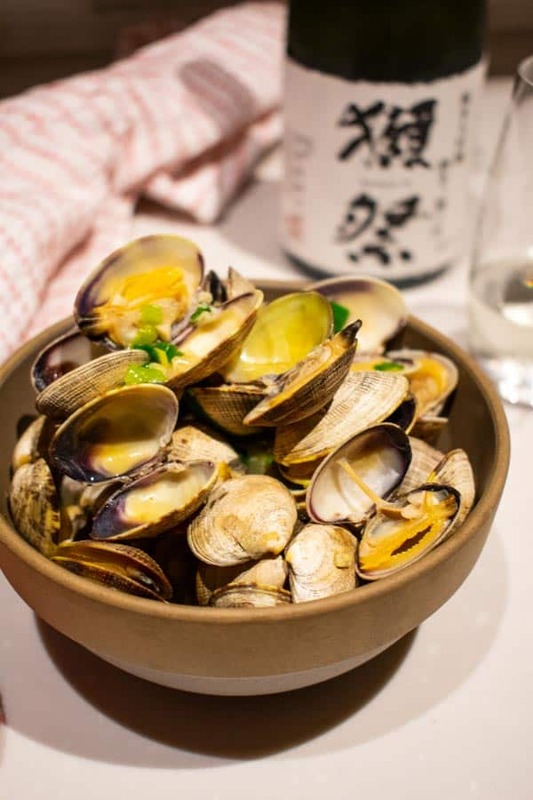 Drink on its own or pair with the rich butter and soy sauce on these manila clams, fit for any Iron Chef. Soak manila clams in water with 1 Tb salt for 10-15 minutes to purge any grit. 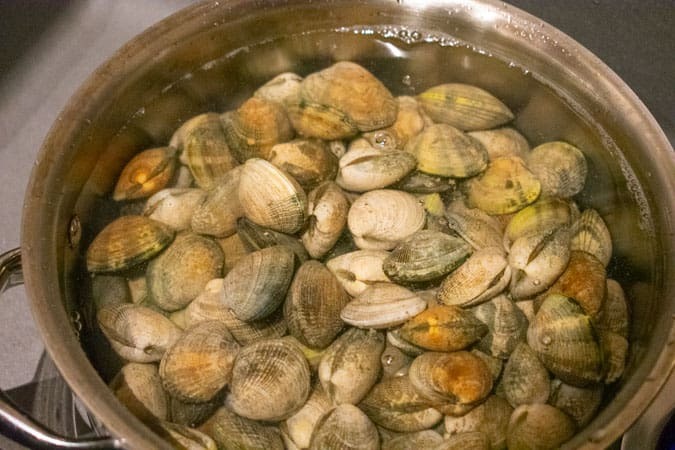 Drain and rinse clams with water. Heat butter in a pan over medium heat. Add garlic and white part of the green onion. Cook for about a minute. Add sake and bring to a boil. Cook for 30 seconds to remove alcohol. Add clams, cover pan, and steam until the clams have opened. About 3-4 minutes. Discard any unopened clams. Stir in remaining chopped green onion for garnish. Serve hot. 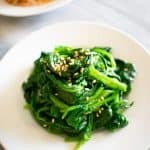 This recipe would also be divine served over hot buckwheat soba noodles for an Asian version of spaghetti and clams.